There are a multitude of recreational and leisure activitiesfor children and adults! At the Le Letty campsite, the leisure activities are as numerous as they are varied! Our entertainments team awaits you and prepares, as of now, the activities which will be made available to you during your stay! With sports tournaments, recreational games and activities (Olympics, treasure hunt, Le Letty dances and other activities) and aquatic-based activities (water polo, aqua dance, and others), and cultural outings, there will be something for all members of your family and more besides. With delight and plenty of fun, do not hesitate to take part in our recreational and leisure activities! Holidays are meant for having fun! Even within the campsite, you can take part in a multitude of recreational...and sports activities! As holidays are meant for having fun, they may also be the opportunity to take up sports or indeed start start particular sports again. On foot, by bicycle, on terra firma or in the water, all these means are good forms of exercise! Whether to let off steam or to relax, you will always find activities to suit your tastes at the Le Letty campsite. During your stay, you will able to, for example, keep fit by taking advantage of our weights room which is fully equipped with free access. A tennis court awaits those hooked on racket sports, and a multi-sports ground, as well as a play area for the very young at the entrance to the campsite. There is an area for playing boules as well as an archery stand (an activity with training and supervision by an activity leader) and a games room with billiards and pinball, also on-site. Aquaerobics classes are given for free from Monday to Friday in one of the aquatic park pools! These classes are perfect for eliminating the excesses of the day before and getting the day off to a good start! Still in the swimming pool, swimming lessons (for which there is a charge) are also provided by a swimming instructor. At the end of their stay, learner swimmers receive a certificate! 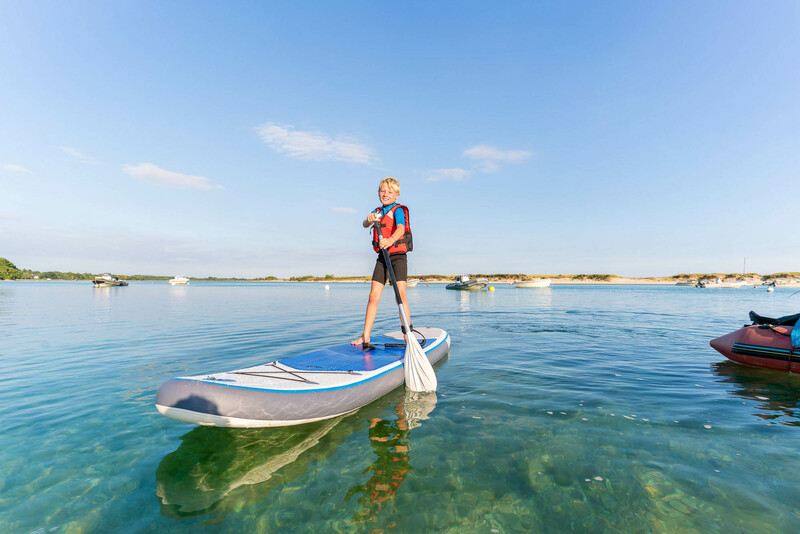 Water-based activities do not end with the aquatic park, as on-site it is possible to hire kayaks as well as stand-up paddle boards so as to treat yourself a trip on the Mer Blanche or the ocean. Close to the campsite, you have the possibility of going to the UCPA Bénodet sailing school located 300 metres from the campsite. Sailing boats, catamarans, surfboards and kit surfing, enable children and adults to register there during their stay. At only a few hundred metres from the Le Letty entrance, a bicycle hirer enables you to cover the multitude of mountain bike tracks surrounding the campsite. For your periods of rest as a family, a library is open throughout the day. It is possible for you to borrow French and foreign books for free. The free Wi-Fi connection in the “L’Oasis” bar enables you to navigate your favourite sites and communicate with your friends! All of these take place within a convivial and warm atmosphere! •	discovering the Glénan Islands archipelago, and the most beautiful river in France, l’Odet, aboard the Vedettes de l’Odet (from the port of Bénodet 2 km away). There is an automatic ticket machine in the activities bureau of the Le Letty campsite.